The Cambridge Animal Alphabet series celebrates Cambridge’s connections with animals through literature, art, science and society. Here, N is for Naked-Mole Rats, which won’t win any beauty contests, but can live for 30 years and may be able to help in the development of new therapies for chronic pain. ‘Bizarre’ is a kinder word than ‘ugly’ and may be a more accurate description when it comes to a rodent with remarkable attributes. The naked mole-rat might look a bit like a raw sausage with protruding teeth but its behaviour and physiology are fascinating. Zoologists first began to explore the unusual lifestyle of the naked mole-rat in the 1970s, identifying it as the only known mammal to be ‘eusocial’. Rather like bees, naked mole-rats live in colonies in which powerful ‘queens’ control groups of as many as 300 animals. Researchers soon discovered that this small animal, which is native to East Africa and lives exclusively underground, packs a number of other surprises. It is unique among mammals in being poikilothermic (cold blooded) and is extremely efficient in its use of resources. When the naked mole-rat finds a calorie-packed underground tuber, it eats what it needs and then covers the tuber with soil so that it can continue growing, meaning that the naked mole-rat, like humans, farms its crops. Now neuroscientists and others are focusing on the ways in which the naked mole-rat differs from other rodents (such as mice) in other unique respects as a means of understanding conditions such as ageing, cancer and pain. 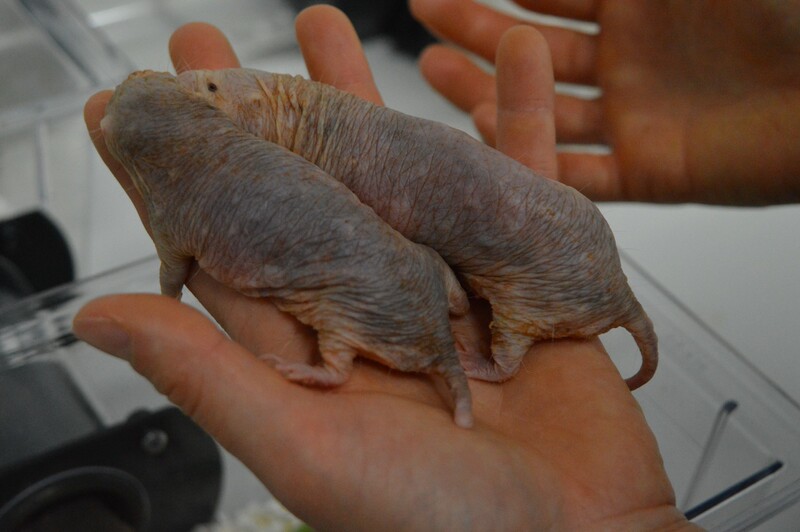 Dr Ewan St. John Smith, a researcher in the Department of Pharmacology, is one of only two scientists in the UK to hold a Home Office licence that allows his group to keep and study naked mole-rats in laboratory conditions. Smith has been studying the naked mole-rat for the past ten years, moving from a broad interest in the animal’s peripheral sensory system (e.g. how the animals detect noxious stimuli) to focus on molecular and cellular mechanisms that enable healthy brain function throughout their long lives. 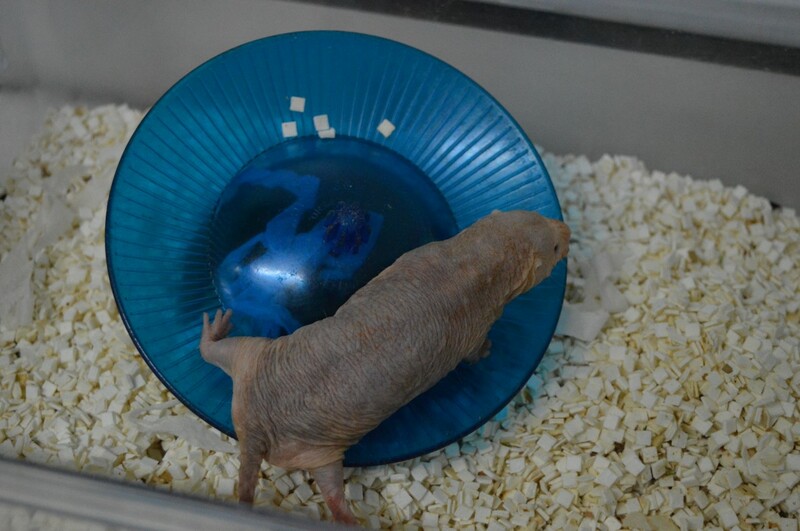 By understanding the physiology of the naked mole-rat, and its differences with that of mice, Smith and colleagues are helping to pinpoint mechanisms that might, in the future, help clinicians to treat human conditions. Just one of the significant differences between naked mole-rats and other small rodents is their long and healthy life span: typically they live for 30 years against an average of two to three years for mice. “Naked mole-rats age quickly right at the end of their lives — and the females remain fertile right to the end, sometimes producing as many as 20 offspring in a single litter,” said Smith. An apparent resistance to the cancers which shorten the average lives of most mammals is likely to be a key reason for this longevity. “At this point in time, it might be an overstatement to suggest that naked mole-rats don’t get cancer,” says Smith. The naked mole-rat’s resistance to acid-induced pain is thought to stem from its underground life style: the labyrinths of burrows in which colonies live are high in carbon dioxide and low in oxygen. Carbon dioxide produces acid when it mixes with bodily fluids and naked mole-rats have developed an insensitivity to acid-induced pain, which enables them to live in a habitat that to many other mammals would be toxic. In a study published in 2011, Smith and colleagues discovered that the acid-insensitivity is likely to be the result of a variation in a protein that is responsible for sending electric signals in nerves from the periphery to the spinal cord. The naked mole-rat version of this protein is switched off by acid, which, like a local anaesthetic at the dentist, then prevents painful signals reaching the central nervous system. “Identification of the differences between how the nervous system functions on a molecular level between species is the key to understanding more about the incredibly complex ways in which the human nervous system functions — and may, in the long term, help us to set targets for the development of new therapies for treatment of conditions such as chronic pain,” said Smith. Next in the Cambridge Animal Alphabet: O is for a bird that is inspiring physicists to develop wind turbines that are more efficient and less noisy. This story first appeared on Medium. Click here for the original article. Visit the Elsevier Store to access books on animal science and much more! Below is a recently published book on animal behavior. Use discount code “STC215″ at checkout and save up to 30% on your very own copy! Written by authors who combine almost 60 years of experience, the 2nd edition of Animal Behavior covers the broad sweep of animal behavior from its neurological basis to the importance of behavior in conservation.